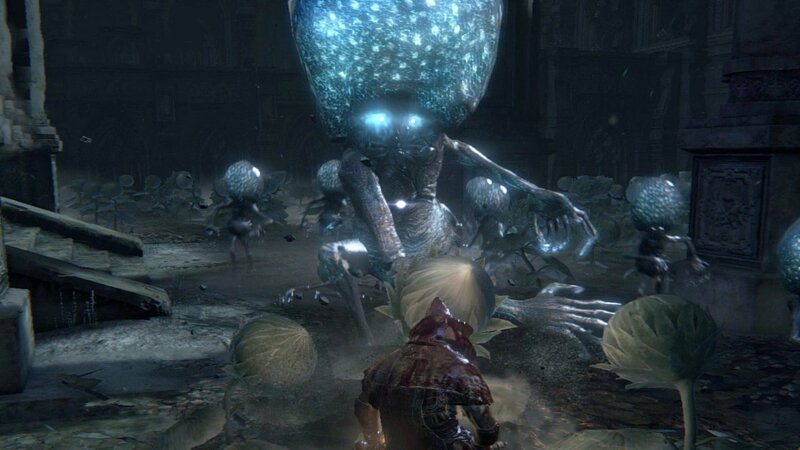 The Celestial Emissary in Bloodborne is found at the top of The Choir, deep in the Orphanage. It's somewhat of a gimmick fight, with the additional enemies posing as much threat as the boss and none of them having any real power. Much like the Witches of Hemwick earlier in the game, hide and seek is the name of the game for the early stages of play. This is potentially the easiest boss battle in the entirety of the game, rendering repeated failures here as somewhat of an embarrassment. No pressure. From the outset, you may be somewhat confused. Where's the boss? Has he gone on a celestial vacation? Our good friend the Emissary is actually hiding itself within the ranks of the standard mobs that litter the arena, and you're going to need to root it out. It's actually fairly easy to distinguish, though – standard mobs will chase you in the early stages, whereas your cowardly target will remain in the central garden, waiting to be taught a lesson. Standard mobs will indefinitely spawn here, so the best course of action is to determine which is the Celestial Emissary and then move in and aggressively attack with area of effect strikes until its health hits roughly the halfway point. Then, the fight will change. The blue blob will grow in both size and confidence, chasing you down with what can only be considered the most easily read and often slow attacks known to hunter-kind. Let it follow you back up the stairs, where you can hopefully fight it in a one-on-one encounter that honestly shouldn't last more than a minute or so. Head onto the real boss of The Choir with 24,640 Blood Echoes, the Communion Caryll Rune, and an Arcane Damp Blood Rune (6) padding your Bottomless Box. Admit it, then: how many times did the Celestial Emissary end you? Did you beat it first time? Confess all in the comments section below. This... This is one of the bosses I missed. I've also heard that he is extraordinary weak to fire (aside from being really weak as mentioned in his article). I'm kicking myself for playing late and rushing myself through the last boss fight... This was a gimme. @Mrskinner lol i had to dubble check the trophy to conferm that it was a Boss... it only landed 1 hit on me lol and went down in about.. 6? mabe 10 hits (I was useing a fire sword at the time) still prvided a quick lol. Man, I have died 5 times against it... I guess I was just tired, but still... Now, the next boss was something else entirely, I hated it so much! I can't count the number of times I've beaten this boss before he even transforms. Embarrassingly easy.